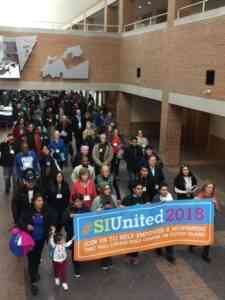 A group called Sustainable Staten Island organized a conference on the anniversary of the first Women’s March of a coalition of grassroots community groups and organizations. 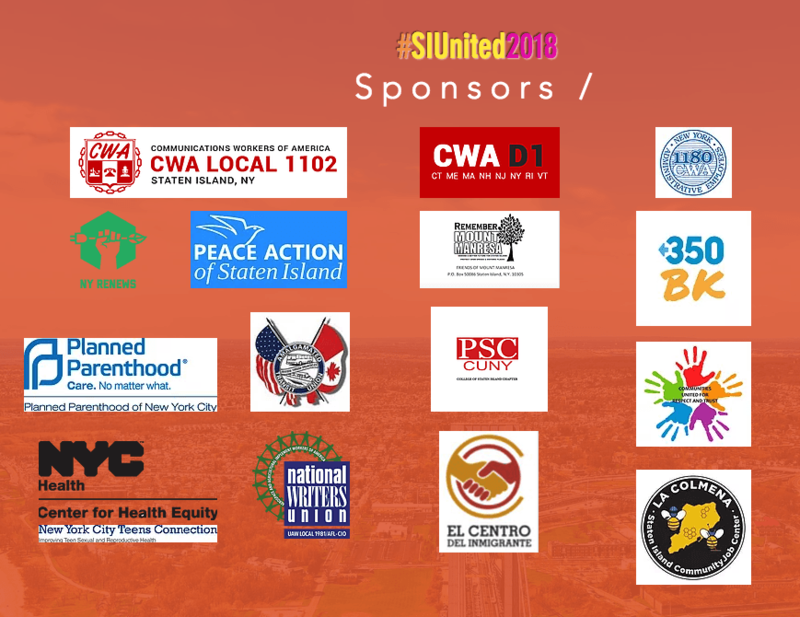 Under the #SIUnited2018 banner, they gathered to build a strong progressive movement in New York City’s most conservative borough. Visit the conference website for more. we are committed to live together in peace with one another as good neighbors, and to promote better life for all Staten Islanders. 1. All Staten Islanders have the right to equal protection of the laws, regardless of citizenship, ethnicity, sexual orientation and religion, granting each one of us to live our lives without the threat of discrimination. 2. All Staten Islanders have the right to employment opportunities, to fair conditions of work, compensation, and protection against unemployment, and the right to form unions for the protection of the pursuit of happiness. 3. All Staten Islanders have the right to a fully publicly funded and quality education that will equip them in their journey for meaningful employment and purpose in life. 4. All Staten Islanders have the right to accessible quality healthcare that will promote the strength and longevity of the body and mind. 5. All Staten islanders have the right to long term comfortable, affordable, and secure housing that will protect them from the storms of nature. 6. All Staten Islanders have the right to clean water, air, parks, streets, and protection from climate change that is destroying Staten Island and our planet. 7. All Staten Islanders have the right to quality mass public transit, modern and reliable bridges, roadways, to ensure the meaningful enjoyment of life and family. 8. All Staten Islanders have a right to enjoyment of the cultural and natural heritage through the preservation of natural lands, and the designation of public structures for the purposes of entertainment, education and public gathering. 9. All Staten Islanders have the right to express their voice by protests, letter writing, lobbying, rallies, and all free speech protected by our inalienable right. our fundamental belief is that Staten Islanders, acting locally while thinking globally, have the power to make a better democracy for all. These rights are not exhaustive but all of us representing Staten Island are assembled in the steps of our local government, have agreed to the present Bill of Rights of Sustainable Staten island and do hereby establish our borough-wide organization for the promotion and expansion of these rights. The conference enlisted an impressive list of sponsors.